Boredom is not allowed: Action Packed isn't just the maker of this stunning piece of sports memorabilia, it's also the perfect way to describe it. Rocket is running so fast, his gloves are stretching up his forearms! ZOOM! His bulge appears to be in two places at once! POW! Then there's that phallus-shaped icon with his name on it! BAP! And look out for that crazy, action-packed trapezoid thing jutting onto the card! 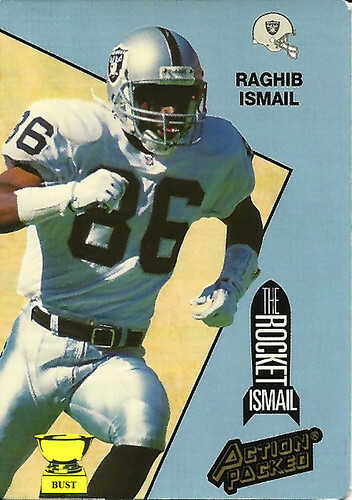 There's so much going on, the cardmaker had to cut off three of Ismail's limbs and add a boring little clip-art Raiders helmet just to avoid an action overdose!